Akinjis, meaning 'raiders', are light cavalry serving in Muslim forces. These Akinjis fight unarmoured for speed and are armed with a bow. Able to adopt a shooting circle formation, which provides constant fire against the enemy. 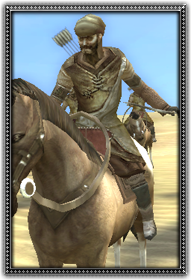 While useful for harassing flanks and enemy archers, this unit will quickly dissolve in melee combat. A guild designated for mercenaries.